The secret of longevity is recycling, at least for galaxies, say astronomers who have used a trio of the world's best telescopes to study the uncharted space around vibrant star-birthing galaxies and their not-so-vibrant siblings. Galaxies learned to "go green" early in the history of the universe, continuously recycling immense volumes of hydrogen gas and heavy elements to build successive generations of stars stretching over billions of years. This recycling keeps galaxies from emptying their "fuel tanks" and therefore stretches out their star-forming epoch to over 10 billion years. However, galaxies that ignite a rapid firestorm of star birth can blow away their remaining fuel, essentially turning off further star birth activity. This conclusion is supported by a series of observations by the 10-meter Keck I telescope, the Magellan Telescope and the Hubble Space Telescope. In space, Hubble's COS (Cosmic Origins Spectrograph) collected information about the gases surrounding scores of galaxies with the ultraviolet light from more distant bright quasars that shine through the gases. On the ground, the Keck I's telescope's LRIS instrument (Low Resolution Infrared Spectrograph) and Magellan's MagE instrument gauged the distances to the galaxies, the masses of the stars in the galaxies, and even the rate at which some galaxies are forming stars. The unraveling of galaxy-gas relationship was announced in three papers published in the Nov. 18 issue of the journal Science. 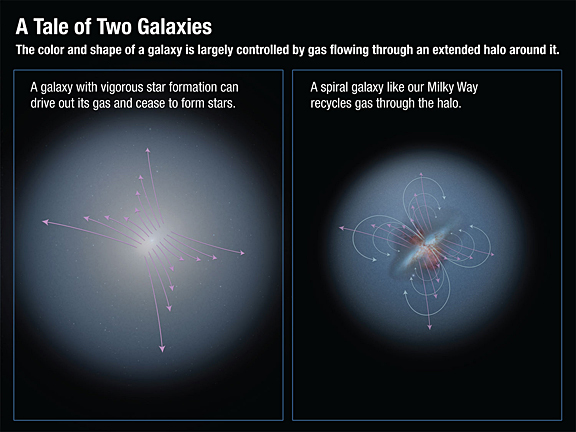 "Having both datasets (ground and space based) allows us to make that very important connection between the extended halo gas and the galaxy's own stars and gas," said astronomer Jessica Werk of the University of California's Lick Observatory at U.C. Santa Cruz. Werk is a contributing author on all three of the Science papers and the lead author on a supporting paper in Astrophysical Journal, which is slated to be published in January. "With that we can confirm that the gas absorption we are seeing with COS is at the same distance as the galaxy we observe with Keck." Unexpected relationships popped out when the researchers compared the gases around galaxies to the galaxies themselves. "What we ended up finding surprised us," said Werk. "The galaxies that are actively forming stars are surrounded by extended, massive halos of oxygen-enriched gas -- these halos contain nearly as much, if not more gas than is in the galaxy itself." Somewhat unexpectedly, these types of vast reservoirs of gas appear to be mostly absent from galaxies that are not currently forming stars, she explained. "The average person perhaps pictures a galaxy as an organized, beautiful spiral structure filled with stars and gas," Werk said. "We are now seeing a huge component of galaxies that has never been seen before -- a very massive, oxygen-rich halo component that extends to large distances outside the visible spiral part of a galaxy -- and it is changing our view of galaxy evolution." Among the key findings of the work is that the color and shape of a galaxy is largely controlled by gas flowing through an extended halo around it. All modern simulations of galaxy formation find that they cannot explain the observed properties of galaxies without modeling the complex accretion and "feedback" processes by which galaxies acquire gas and then later expel it after processing by stars. The three studies investigated different aspects of the gas recycling phenomenon. "Our results confirm a theoretical suspicion that galaxies expel and can recycle their gas, but they also present a fresh challenge to theoretical models to understand these gas flows and integrate them with the overall picture of galaxy formation," said Jason Tumlinson of the Space Telescope Science Institute in Baltimore, Maryland, a coauthor of one of the Science papers.